When someone mentions Bacon & Eggs for breakfast it never looks this good. 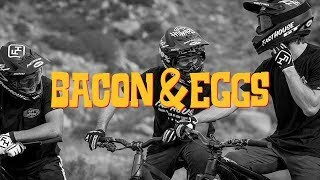 Fasthouse recently teamed up with Tyler McCaul, Ryan Howard and Austin Warren to put together a killer mountain shoot. This time the crew headed down to Southern California to put some tires to dirt. Mother nature had thrown some rain there way which allowed them to build and sculpt one heck a mountain bike track to ride and film on. Smoothed out style and big jumps make this a ride, rinse and repeat feature! Fasthouse presents its first mountainbike video, shot in Southern California. Featured riders include Tyler McCaul, Ryan Howard and Austin Warren. There is a cameo with Tyler Bereman. With a little luck from mother nature and some rain they built themselves an awesome spot to shoot at.